I usually start my practice sessions with some open string bowing. I feel it is good to get the ear "zeroed in" on some known good pitches and to warm up a bit before getting down to some serious (and more recognizable as music) playing. Like I've told some folks (not really in jest), I find it good to start with something where intonation is not really a concern and where it is more difficult to mess it up. Recently I was talking with a friend of mine where I'd given him some advice on playing when he first started and I mentioned open string bowing. He admitted he never did much of it because it was "boring". So I showed him how I practice it, and he decided it was maybe a bit less dull than he'd thought and maybe useful enough to try again, so far as including it in his practice. Sure, it would get dull, if you just spent like half an hour going BWAAAH BWAAAH BWAAAH on the open strings. And while that can help a bit maybe with working on getting power and tone early on, it can be hard to see how it much relates to actual music. But if you add a metronome and some thought to practising useful things with it, it becomes less tedious and I feel a bit more useful. So I start with 5 min of just bowing on the open strings, after I've tuned up my violin, rosined the bow and etc. I set the metronome to some reasonable tempo, like maybe 90 bpm. Then I practice with doing several notes on each string, trying to use the whole bow length and make each note 4 beats long. Those would be whole notes, in 4/4 or "common" time. I work on getting the notes strong and steady, and keeping the bow moving nice and straight. I also work on keeping the left hand as relaxed as possible, and feeling the vibrations through the instrument and also keeping my bow hold relaxed enough that I can feel the vibrations through the bow with my right hand while playing the notes. If you are working on learning to read and write music, you can "go for the extra points" by grabbing a blank sheet of music staff paper or TAB sheet or whatever and writing out the notes first. Maybe start with playing the strings in order and then mixing it up a bit to make it a tiny bit more challenging after the first several bars. Basically writing your own "etude" (which isn't the worst place to start with composing). I use a cooking timer to time the sections of my practice. Get the metronome going, then set the timer for 5 min and start it, then start playing. 5 min isn't very long, and with all the things there are to pay attention to and be aware of in your playing, it's up before you know it. That would really be probably enough open string bowing for someone just starting on the instrument, or just starting with getting some open string bowing into their practice session. Doing that for maybe 3 times a day in the first week or so could do a lot for getting one's notes clearer and getting rid of some scratches and squeaks. Next, I practice some half notes. I start at the center of the bow, draw the bow to the tip for two beats of the metronome, then back to the center for two beats. Pause for a tiny instant and then draw from the center to the frog and then back up to the center. There we go, 4 half notes. The only trick is to remember to come to a full stop (although a very tiny one) at the center of the bow. If you don't stop at the center of the bow, then you didn't actually play half notes. 5 min gets used up even quicker with that, since there is a bit more to think about and work on. Trying to get all those stops and starts nice and clean and pretty and each note nice and even takes a bit of work. The next obvious section to add is 5 min of practising quarter notes. I reckon most people get the idea well enough that there isn't a need to go into detail, other than to mention that the trick is to work on giving a fair bit of practice to each of the 4 quarters of the bow you can use. This is particularly good, since you can also listen and work on being aware of how the different parts of the bow sound a little different when you play. 5 min is barely enough time, and it goes by pretty quick. But that was 15 min of open bowing practice that also worked on timing/rhythm a bit. Not a bad little warm-up. If one starts with the whole notes each day and then adds the half notes and quarter notes to one's sessions later as one feels comfortable, it doesn't take up that much practice time. 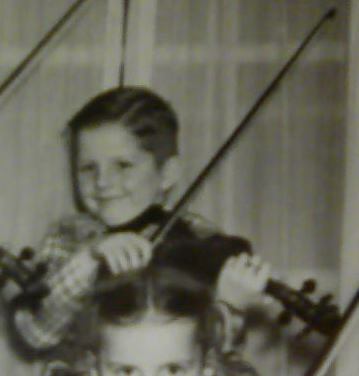 I start out each time with open string bowing. Long and short bows. Do it for at least 15minutes or so. It is also very helpful for being comfortable with my tuning and the open 5ths. After that is done I go into scales. Sometimes with the MIGHTY METRONOME sometimes without. Never thought of "open strings bowing" as a dull or boring. If i have enough time to practice i can spend about an hour on that part =) Not at once, but summary during the session. 1) Full bow strokes - controlling tone and bouncing. 3) Different bow strokes: staccato, martele, etc..
5) Lots of other things, like speedy bowing + string-crossing; using different parts of bow + combined bow strokes with string-crossing... etc. Wide field for imagination! Dull? Don't make me laugh, i'm swetting like a pig! I do favour open string practice. Through this post I request FM to come up with a tutorial which should definitely help beginners in getting a nice and clear tone. Hope he responds. But I know he is a busy man and has to find time. Let us wait. Greatly article and explanation Dan. Too awesome! Dan,,very. very.. helpful. Thank you. I will start today working as you have outlined. Your post should be stickied or some such. And if you have any other suggestions, there are eager ears awaiting. First.. You can work on dynamics. Especially when doing the full bow strokes, try to start them very quietly, and come to full volume as you're passing the center of the bow, and then fade them out to as quiet as you can play again at the end of the stroke. Or starting very soft and ending very loud at the very end of the stroke or vice versa, or anything else you can come up with that seems like it might be useful. Second.. You can experiment with using the flat of the bow hair vs the edge of the bow hair. Different sounds, and you can play around with using them in different places on a single stroke. It does effect dynamics, but to me it mostly is a difference in timbre. The flat of the bow is a bit "richer", since more hair is grabbing the string, and the edge is a bit "purer" since you get a little less bow noise. Again, both useful sounds, and I find that doing them as an exercise in practice eventually lets you use them rather automatically in playing to get the quality you choose. That's pretty much true of *any* exercise in technique, though. We do them in practice so they come more easily and naturally without a lot of thought needed when we play. I mean, that's why we practice in the first place, right? Things gained in technique practice (exercises) can help with many pieces we play, whereas just practising a piece or some pieces will mostly help just those pieces. That is how I've noticed it seems to work with me, anyway. Use of dynamics and the timbral capabilities of the instrument help to make the sound more interesting. Less boring. And doing that in a controlled way, as you intend it to sound, is part of the difference between the noob sound and the more accomplished player's sound on any instrument I can think of. But back to the open strings. Even though it is only 4 notes, you can also improvise or compose a bit. Make a little piece out of it, and work on making it sound kinda good, so it feels (and sounds) less like "just an exercise". You can also practice your notation writing skills, if you get or make some blank score sheets and write down things that sound nice as you find them. Especially at first, a little bit of structure helps. So what I did (and still do some sessions) was what I called "a noob waltz". Full bow, say, frog to tip, on the G string, then half bow (in this case, tip to center and then center back out to the tip) on the D string. Then you're ready to do those moves over again, but this time starting from the tip. That way you're not neglecting practising the bow moves in each direction. Simillar to what fiddlers do for "shuffle bowing' except that is usually at a faster dance tempo and uses less bow. That whole "up kitty down kitty" thing fiddlers use for working on shuffle bowing. Doing it with a full bow and at a slow tempo, you can get a feel like a slow waltz. Your bowing arm does get used to the basic movement, though, so it makes it easier later when you may want to actually play with a simple shuffle on more "fiddle-y" tunes. So maybe you start with full stroke G, half stroke D, half stroke D, Full stroke A, half stroke D, half stroke D, and back to full stroke G. Or maybe you'd rather do full stroke G, half stroke D, half stroke D, full stroke A, half stroke E half stroke E, or whatever. It's 4 notes, nothing for the left hand to finger, so you play around and see what you can come up with while making those strokes nice and even and seeing how good you can make it sound. 4 notes also are really easy to remember where they are on the staff if you run across some combinations you feel sound good. Good time to start composing. And why not start with a little waltz? Anyway.. That's quite a bit of fun/work one can get out of those 4 notes. All of it can also be applied (obviously) in your regular playing, and not just open strings. I should stop there, probably, but I'm going to tell you a couple tricks I use *just* for the open strings. I am calling them "tricks", because I'm pretty sure they are not actually part of "proper technique". In fact, there are probably teachers that would smack you across the knuckles with a ruler for even just *reading* about them.. LOL I don't know, I don't have a violin teacher. So I don't have to worry about that. First trick: You no doubt notice that the open strings are a little louder/stronger than fingered notes and they also have a bit more "sting" to their sound. If you put your finger down on the string at the nut.. Where it crosses the nut and not the vibrating part.. and experiment with sliding your finger onto the string just a little ways, you can find a place where your finger damps the string just a little without changing the pitch. It makes it sound more like a fingered note. Don't press down like you're trying to get the string to the fingerboard there, just an easy little bit of pressure. That gives you a choice between the brighter "sting" sound of the open string and something closer to the sound of a fingered note. Handy if the open string just sounds a little too aggressive at a spot in a song/piece when you're doing regular playing. Second trick: You can vibrato that. Sorta. Assuming you are already working on vibrato, you can do the same move on that place on an open string to get a sort of vibrato. I say "sort of", because it is not a true musical vibrato. Properly, vibrato sways both below and above the target pitch. This will only "wobble" between the target pitch and above. So it is only half of a real vibrato. But the average listener would probably never notice that. They never seem to with guitar where (other than using a "whammy bar") vibrato is pretty much always only upwards. In any case, it can beat the plain sound of just the open string one those long notes and any other places where you feel it sounds nice. And hey, getting in some practice on the low position vibrato while doing open string bowing is yet another way to keep the open string bowing exercises interesting and maybe even kinda fun. From the length and importance of what you wrote, my saying thank you, seems less than adequate. But knowing that I will spend hours practicing what you wrote and that others will do the same, I hope makes it worthwhile. Thank You. Once again.. yahoo... very very good stuff Dan. Thank you. Glad you liked it. Just "paying forward" and trying to give a few pointers that may be of use for some fellow musicians. Dang it, I have insomnia again!! I love that I can access the forum for good tips and violin stuff at all hours of the day and I have been able to access and write at work now, so I have been feeling more connected and happy to read and respond to everyone. Thanks a million. Good ideas Dan but are you answering my question or giving members open strings practicing tips? @Fiddlerman: I was giving some tips on a few simple things to do with open string bowing. However, I would definitely second Suresh's request for a tutorial on how to get a nice clear tone. I gotta think that proper bow pressure, bow tension and rosin will give you a good clear tone. It works for me. One more thing, tilting the bow is ok as long as it's not laying on it's side with only a few hairs touching the strings. Squeaks develop that way. I prefer a slight angle on the bow, with the stick tilting away. Yeah, but it is a question that comes up time and again with beginners who just got their violin, so I think it would make a great FM tutorial vid. They barely got the thing out of the box and sort of in tune (hopefully) and they want to know what they are doing wrong because it sounds all scratchy and/or squeaky. A tutorial to send them to that explains it in a step by step fashion could be good. Besides, never know. There might be some points that I am missing and don't even know I am missing yet. So I'd definitely watch it, even though I generally like the sounds I can get out of the instrument. Pierre makes some darn good tutorials. I'm having a ball doing this, but I have discovered a problem. At 80 bpm working on 1/16 notes, I'm trying to play up, down, up, up, then down up down down (paradiddles). When trying to stop between up and up or down and down I'm getting a secondary sound as I'm actually backing up instead of just stopping the forward movement. I will work it out, but it is aggravating. Though, as I said, I'm having a ball. 16ths and 8ths on open string..